As recommended I served homemade Granary bread. Good Food magazine, February 2009. 1. Heat the oil in a large saucepan. Season the lamb, then fry for a few mins until browned. Add the onion and barley, then gently fry for 1 min. Add the veg, cook for 2 more mins, then add the Worcestershire sauce, stock and thyme. Cover, then simmer for 20 mins. 2. When everything is cooked, spoon about a quarter of the soup into a separate pan. Purée with a stick blender (or put into a normal blender and whizz), then stir it back into the rest of the soup. 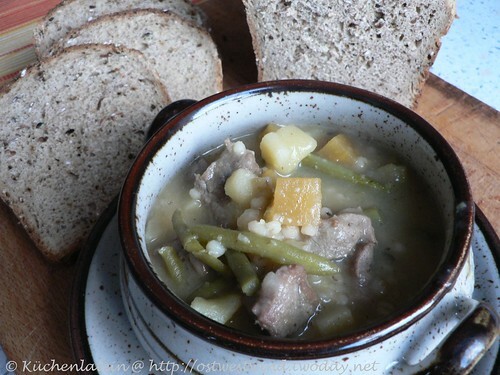 Add the green beans, simmer for 3 mins, then ladle the soup into bowls and serve with granary bread. Dieser Beitrag wurde unter Recipes & Posts in English abgelegt am 30. Januar 2009 von kuechenlatein.